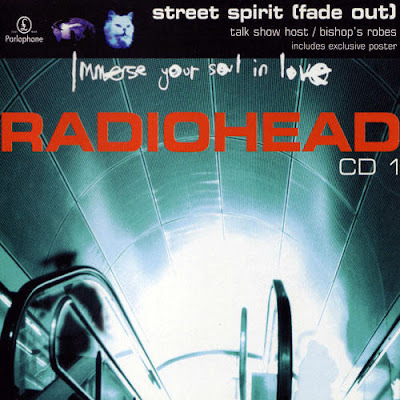 Fourteen years ago today, on February 1, 1996, Radiohead appeared on the British television show, "Top of the Pops," and performed "Street Spirit (Fade Out)" from their then new album, The Bends. (The video of this performance can be found above.). It was with that album, their second, that the band established that they would not remain a one hit wonder (something that even their most fierce partisans suspected they might become in 1993 when "Creep" was their hit single.). Not only does The Bends contain the radio friendly "High N' Dry," and the introspective "My Iron Lung," it also features "Fake Plastic Trees," a nearly flawless rock song, which starts softly but gradually builds until it a powerful and emotive power ballad, if that term applies. But "Street Spirit (Fade Out)," with its haunting opening, is what they played 14 years ago today.